The second group to finish is also exempt from the next physical fitness challenge and receives 7 points (but has the option of participating in the physical fitness challenge in order to gain an additional 3 pts. The last two groups each have to participate in the physical fitness challenge. Each group will receive 5 points for successfully completing the challenge. Choose from the PFCs below or create your own. Score increase ensures that students still have a chance to win till the end. Give 1 final question and have them write down their answer. Award 10 points to each group that gets it right or…. The group with the most points in the end wins!!! 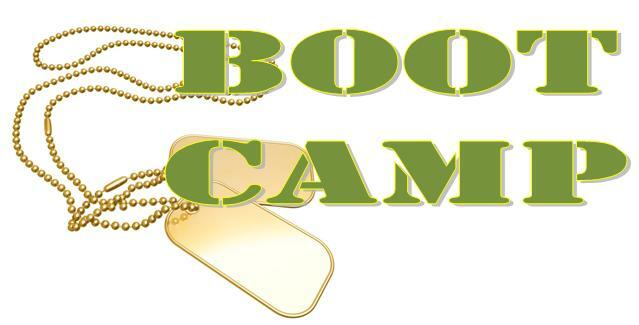 Boot Camp Tee Shirts: Survival of the Fittest, I survived Mr./Ms. ? Boot Camp, etc. Medals (This way each group would get something-gold, silver, bronze, participation, achievement, great sportsmanship, etc. Treat, dessert buffet (ice cream), fruit, etc. Have students run from starting line, around cone, and back to starting line carrying weights. Bring in different products, small, but FACS related, and allow students to review each product. It can be food or anything else that is inexpensive. Choose different types of products within the classroom such as small kitchen equipment, utensils, computer software programs, books, etc. The ultimate goal of the project is for the student to be able to persuade their peers on the usefulness of the product. After students have presented their product and persuasive speech, students will be given the opportunity to vote on whether or not they would purchase and/or use this item. If more people vote yes, you can call this a success and allow the presenter to keep the product or award them with another type of gift such as a coupon, food, bonus points, etc. Of course, everyone is doing the whole bucket list thing, so why not incorporate it into your classroom. Bucket lists are a way for students to set goals, live a more achievement filled life, learn to plan and more! This activity also has a few variations for how you can use it in your classroom. Bringing in a bucket of their choice; ice cream buckets, paint buckets, sand pails, mop buckets, etc. Decorate the bucket and put all their list items inside. Have the students choose something each week from the bucket to work on when students finish assignments early or “think” that they have “free” time. This may also be used as homework assignments-working on bucket list items. Another way for using Bucket Lists in the classroom is for the teacher to create a bucket with different achievements or tasks. You may also have the students submit different task ideas/achievement ideas to be placed in the bucket. At the beginning of the semester have students pull one or more tasks from the bucket list to attempt to accomplish by the end of the semester. This is a great motivator for students because they really want to be able to state specifically what they have accomplished in a short period of time. Got more ideas to add to the bucket list, head over to the summer camp forum and leave them there. Are you ready for week 2?